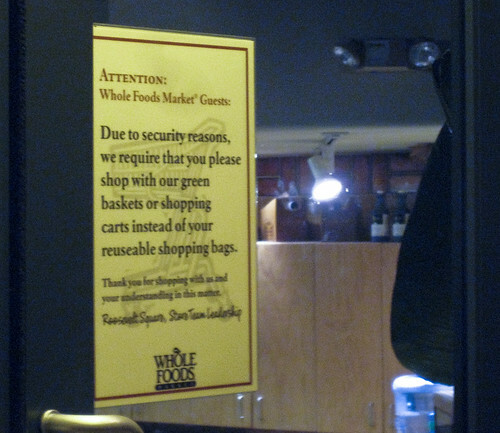 While a bit ambiguous, I believe that the sign is intended to discourage only the use of one’s own bags while shopping, rather than being a blanket ban on non-Whole Foods bags. Still, the sign made me do a double-take, and there’s no doubt we’re heading for a period of behavior adjustment on everyone’s part as free disposable grocery bags become rarer. When it comes to a battle between historic sign craftsmanship and Grammar Nazi tendencies, do we all lose? That’s the apparent lesson from a pair of twenty-something hipsters who set out on a course to fix America’s typo-addled signs, only to end up with a year’s probation for defacing (defixing?) a historic 1930s placard in Arizona. Unfortunately the Parks Service valued historical authenticity higher than the eradication of Grocer’s Apostrophes, saddling Jeff Deck and Benjamin Herson with a one-year bannination from the National Park System. Wonder if Seattle’s historic hand-painted signs can rest easy now? Seattle Theatre Group unveiled the (apparently) most controversial banner to date on Monday (May 19th) at 1:00PM on the east facing exterior of The Paramount Theatre. The banner features Lucy, star of Broadway’s Avenue Q, in all her provocative glory. “This is the first billboard that’s made me blush,” says STG Executive Director Josh LaBelle. AVENUE Q is Broadway’s smash-hit 2004 Tony Award® winner for Best Musical, Best Score and Best Book. A hilarious show full of heart and hummable tunes, AVENUE Q is about trying to make it in NYC with big dreams and a tiny bank account. Called “one of the funniest shows you’re ever likely to see” by Entertainment Weekly, AVENUE Q features a cast of people and puppets who tell the story in a smart, risqué and downright entertaining way. AVENUE Q has not been authorized or approved by The Jim Henson Company or Sesame Workshop, which have no responsibility for its content. As much as I loathe those stupid “Pigs on Parade”, you’d think that I’d hate the Nutrcrackers that take their place during the winter. Oddly enough, I’m not so bothered by the nutcrackers. I still think the whole “let’s have artists decorate these things and leave them all around town” idea has been beaten to death but the nutcrackers amuse, not annoy, me. This guy’s outside the Qwest building. As reported by the Associated Press in the Kitsap Sun, a new sanctuary for chimpanzees retiring from the biomedical research or entertainment industries will be opening in Cle Elum in the spring. Seven will be moving in at the time of the opening. The chimps, currently living at a lab facility in Pennsylvania, are aged 24 to 34. Chimps, whose average life span is 35 – 50 years old, can live into their 60s, so these chimps could be settled in for quite some time. The story doesn’t mention if visitors will be welcome. I sure hope so–I love chimps and I’d be thrilled to go see these animals relaxing in a well-deserved retirement from being poked and prodded and injected and examined. It would make a nice companion trip to a visit to Ellenburg , a mere 25 miles away, where the Central Washington University plays host to the Chimpanzee and Human Communication Institute. just imagine the possibilities of an independent republic of Capitolhillistan. Those of you who are hoping to have a little bit of liquor to go with your explosions would do well to shop early. A friendly-fonted warning sign alerted me that liquor stores will be closed on Wednesday for Independence Day. Along with being a nice perk for state employees seems like a decent public safety measure — who needs a crazy uncle with bottle in one hand and trunk full of fireworks in the other? This is probably the most content-free post I’ve ever made, but the trip back from Presse last night took us by a sign that made me do a double-take: Sleep 101 or Sleep lol? Obviously the answer in either case is to stop spending so much time on the interweb.